French duo Jamaica, who were last in NYC during CMJ where they played shows like dance party FIXED and Fader Fort, have just kicked off an American tour. They played their first of three NYC shows last night at Knitting Factory with Via Audio and Miniboone. Anybody go? They play again tonight (4/15) at Mercury Lounge with Reptar and will get funky for the stroller set at Kidrockers Saturday afternoon (4/16) with Dinowalrus. …and on the single “I Think I Like U 2″, it seems like the big-name help came in handy. It’s a song that’s a little cheesy and way too excited, but in the way that really sharp, fun pop music can be without feeling too patronizing or dopey. As familiar sounding as it is (even the lyrics– “She was never pretty, she was only young”– feel like stolen goods), it works, plain and simple. If we give Jamaica the benefit of the doubt, everything else on No Problem is then, in some way, cut from the cloth of “I Think I Like U 2″, and it’s a sensible, if not unambitious, plan of attack. But not a single one of the resulting songs captures the same kind of ebullience and fluidity, instead opting for choppier structures that, in most cases, seem bent on keeping people off the discotheque floor. 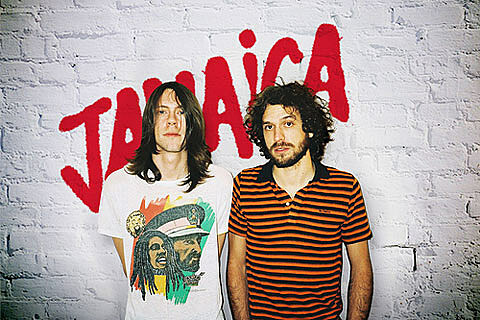 While the comparisons to other other popular French bands (all three of them) are apt and unavoidable, I think Jamaica are certainly fun in select doses. There’s some songwriting smarts in there, they just need to find their own way. But no doubt kids will love them. All Jamaica tour dates, plus a couple videos, are below.